Our "Adapta J79" cylinder lock barrel range is a 5 pin tumbler, open key profile system ideal for medium security applications in residential & commercial settings where high security cylinders are not required & where ease of key duplication is not an issue. Accredited to BS EN1303 Durability Grade 6, these high quality but inexpensive cylinder lock barrels are available in a choice of 6 architectural quality finishes to match perfectly with our door furniture ranges - Polished or Satin Brass, Polished Chrome, Satin Nickel, Antique Brass & Antique Dark Bronze. Our MP10 High Security Cylinder Lock Barrels are ideal for applications in commercial or industrial settings where security against unauthorised duplication of keys is required. 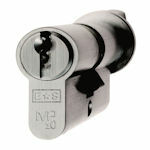 These quality lock barrels are accredited to the highest grades of BS EN1303:2005 for durability & key security & are built with anti-pick, anti-drill & anti-bump features as standard & can be fitted with suitable cylinder guards or security escutcheons to provide BS EN1303 attack resistance grade 2. Available in Euro Profile & Round Rim in 4 quality finishes to match perfectly with our door furniture ranges - Polished Brass, Polished Chrome, Satin Chrome & Black. Designed & built to withstand all common forms of attack, our "Adapta Prime" cylinder lock barrels are suitable for applications that requires both high physical security & ultimate protection against unauthorised key duplication. 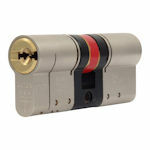 Accredited to the highest grades of BS EN1303:2005 for durability & key security & tested to the 1 star grade of TS 007:2014 + A1:2015 for attack resistance, all Adapta Prime euro profile cylinder lock barrels have anti-drill, anti-pick, anti-bump, anti-snap, anti-twist & anti-plug pull features as standard. Our Adapta Prime cylinder lock barrels are available in a choice of high quality finishes to match perfectly with our door furniture ranges - Brass, Chrome, Satin Nickel, Antique Brass & Dark Bronze. The "ULTION" range of maximum security euro profile cylinder lock barrels is ideally suited to external doors in settings that require the highest physical security & ultimate protection against unauthorised key duplication. 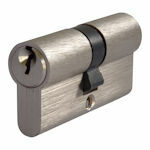 ULTION cylinder lock barrels can be used to upgrade existing locks or as part of a high security package for new doors. Performance tested to the highest, 3 Star grade of TS 007:2014 + A1:2015 ULTION cylinder lock barrels have anti-drill, anti-pick, anti-bump, anti-snap, anti-twist & anti-plug pull features as standard. In addition, the unique "Lock Down" feature ensures the highest possible resistance to snap attack. 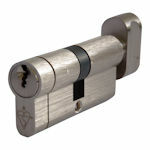 ULTION euro profile cylinder lock barrels are available in single half cylinder, double cylinder & key & thumbturn cylinder variants in all popular sizes & are finished in a choice of Satin Nickel, Polished Brass or Polished Chrome. 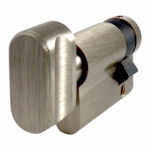 Bathroom Privacy Cylinder Lock Barrels are designed to be used with euro profile cylinder lock cases to provide a privacy function on bathroom & toilet doors & are a popular alternative to more traditional Turn & Release products. Blind Thumbturn Cylinders are often fitted to provide simple keyless locking internally & where no external operation is required. Available in a choice of high quality finishes to compliment our door furniture products including Polished or Satin Brass, Chrome, Satin Nickel, Antique Brass & Dark Bronze.